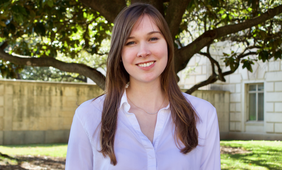 AUSTIN, Texas — Laura Hallas, a Plan II honors, economics and health and society senior at The University of Texas at Austin, is the recipient of a 2019 British Marshall Scholarship. The Marshall scholarship will fund Hallas’ graduate education at both the University of Oxford, where she will pursue a Master of Science in Evidence-Based Social Intervention and Policy Evaluation, and at the London School of Hygiene & Tropical Medicine, where she will pursue a Master of Science in Public Health. The scholarship will cover Hallas’ university fees, cost-of-living expenses, books, thesis research and travel, and fares to and from the United States. As a UT Austin student, Hallas was the editor-in-chief of The Daily Texan, a member of the Texas Orange Jackets and a finalist for the Rhodes scholarship. While earning a bachelor’s degree, Hallas has also been pursuing a graduate certificate in public health from the University of Texas School of Public Health. She held internships with The Dallas Morning News, the U.S. Department of State, Pathologists Overseas and the Dell Medical School, where she currently works in the Health Leadership Apprenticeship Program helping to address health care needs in the community. The Marshall scholarship, now in its 65th year, is funded substantially through the government of the United Kingdom. The intention of the Marshall scholarship is to “strengthen the enduring relationship between the British and American peoples, their governments and their institutions,” according to the British Marshall Scholarship website. It was founded as a tribute to the Marshall Plan, which was named for former U.S. Secretary of State George Marshall and through which the United States provided aid to rebuild Europe after World War II. Hallas is the 26th UT Austin student to receive a Marshall scholarship since its establishment in 1953. For more information, contact: Emily Nielsen, College of Liberal Arts, 512-232-6504. Read an extended Q&A with Hallas on Life & Letters.